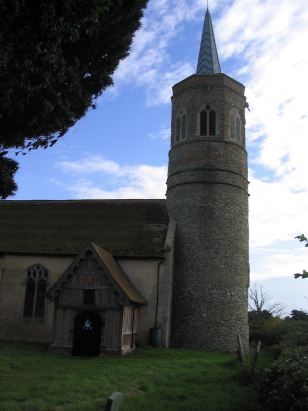 The parish of Shimpling lies in southern Norfolk about 4 miles northeast of the market town of Diss. Shimpling is a largely linear village built along a lane running from Dickleburgh to Burston and sits roughly a mile to the west of the main Norwich to Ipswich road, the A140. The Norwich to London rail line runs through the west of the parish. Shimpling sits on rising ground just to the north of the valley of the River Waveney, which marks the border with neighbouring Suffolk. The area is intensively agricultural and this state would also have applied at the time of this transcript. 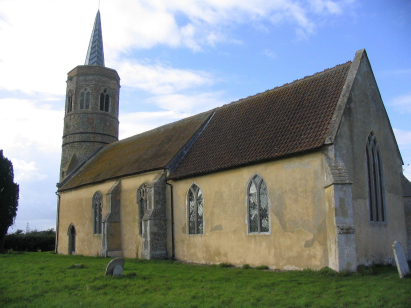 Shimpling parish was rather small, even by Norfolk standards, covering less than 800 acres. The modern walking trail of Boudica's Way passes through Shimpling, running along Dickleburgh Road past St George's church on its way from Diss to Norwich. St George's church sits a few hundred yards to the south of the main lane through the village, at the point where it ceases to be motorable, there is a small parking area by the church. One's eye is immediately drawn to the round tower, a feature usually indicative of an early church. In this case there are three separate ages to the tower, the base Pevsner dates to the 13th century, which is probably the original date of the church, the octagonal upper portion is 15th century and Perpendicular whilst the lead spire was added dating the 1860s restoration. The windows of the chancel show 14th century styles whilst those of the nave are Perpendicular and reflect a major rebuild during the transition from Decorated to Perpendicular common to many Norfolk churches. The wooden porch was added at the same time as the spire. The church sits in an oblong churchyard at the of its lane and the latter is open and with few restrictions to photography. A single standard 800-entry register book covers not only the period of this transcript but runs onwards to complete in the late 20th century. This register is filmed on Microfilm MF1637 in the collection of Norfolk Record Office which was used to prepare this transcript. This film is a fairly recent production and benefits from the improved techniques of modern day filming making for a straightforward piece to prepare.